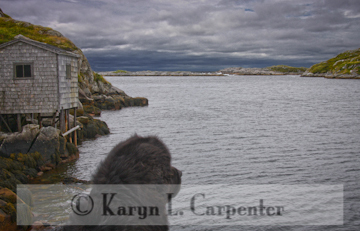 Arayo and I are constantly astounded with the beauty of Newfoundland and the friendliness of her people. Have much to report but need time to type it in, so here is a shot of Miz A enjoying her homeland. Today we make the long drive from Gros Morne National Park to St. John's. Long trip Karyn. Be careful of moose - try to not drive after dark. admit to a bit of envy. Go girl!!!!!!! I'm soooo jealous, it's always been my dream to just go wherever I fancy. Thought I could when I retired. As you can see from my "handle" I love to travel, good thing I did alot of it up to this point, I may not be able to do serious traveling for awhile now. Vikings Lust After Arayo's Hide?